Once you see a mucous retention cyst, you may be concerned about the initial cause and whether it is cancerous. These small sacs are benign, but they should be taken seriously as they can lead to damage in the respiratory tract, including the vocal cords. We will look at the various types and causes of these cysts and possible mucous retention cyst treatment. A mucous retention cyst is a small sac of mucous that forms when a mucus duct becomes blocked due to an irritant. They are typically found in the upper respiratory tract and affect the sinuses, salivary glands, throat, vocal cords, and the lips. A mucous cyst is visible to the naked eye when it is on the lips but may only be discovered with imaging tests when on other body parts. Mucous retention cysts develop as a result of a blockage of the ducts that the mucous secretes through. Each affected region has its own mucous glands for proper lubrication of the surrounding respiratory passages. You may see the common mucous cyst, which appears on the inside of the mouth or the upper or lower lips. These cysts develop after constant trauma to the lip such as biting or sucking lip through the spaces between the teeth. They are commonly seen after a jewelry piercing in the tongue or lips. Although a mucous cyst is painless and harmless, it may lead to a permanent bump. The types of mucous retention cysts are divided into the regions they are found. Our saliva originates through the salivary ducts from the salivary glands. Any trauma or irritation to the ducts can cause the saliva to build up in the glands and form mucous retention cysts. The inner surfaces of our lips are comprised of numerous salivary glands. Injury or trauma to the secretion ducts such as biting or sucking the lips will result in formation of mucous retention cysts. Lip piercings can also impair the ducts function. The maxillary sinuses sit on either side of the nasal passage just below the cheek bones. The localized mucous glands can develop cysts when the ducts cannot drain the mucous. This can happen with frequent chronic sinus infections, trauma to the cheekbone, or from the effects of allergies. Below the forehead sit the frontal sinuses, which can have cysts develop in the same way as the maxillary sinuses. In this case, the mucous retention cyst can lead to severe headaches, eye protrusion, and possibly require surgery to save vision. The vocal cords have nearby mucous glands to lubricate the vocal cords and to assist in producing the voice. If the ducts are obstructed, mucous retention cysts will form. The mucous retention cyst treatment comes into play if the cyst produces severe pain or issues with the localized glands. In these cases, surgery to adjust or remove the cyst is required. 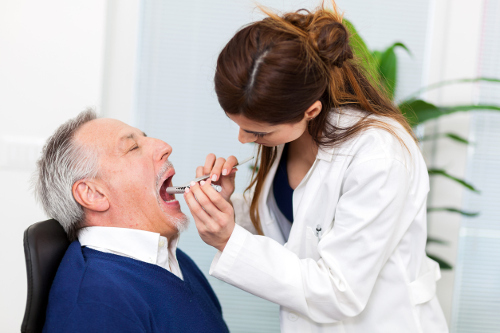 Vocal cord surgery is needed if there are issues with swallowing and speaking. The cysts are removed with a small cut into the folds. Salivary glands with mucous retention cysts are usually drained or removed with a small incision. Throat surgery to deal with the cyst is only performed to drain the mucous. If the cyst is present on a tonsil, then the tonsil itself is surgically removed. Maxillary sinus cysts are usually left to dissolve on their own unless there are frequent chronic sinus problems. Nasal surgery may be necessary to remove the cyst and reconstruct the ducts. A mucous retention cyst can look worse than it actually is as these cysts are benign. They can present with pain and cause issues depending on the region of development. Many cysts exist without notice as they are internal and can only be seen by us when on the inner lips. Treatment is usually only carried out as surgical procedures if the cysts require removal. “Mucous Retention Cyst – Causes, Symptoms, Types & Treatment,” Trendy Damsels; http://trendydamsels.com/mucous-retention-cyst/, last accessed May 31, 2017. “Mucous Cyst,” The New York Times; http://www.nytimes.com/health/guides/disease/mucous-cyst/overview.html, last accessed May 31, 2017.